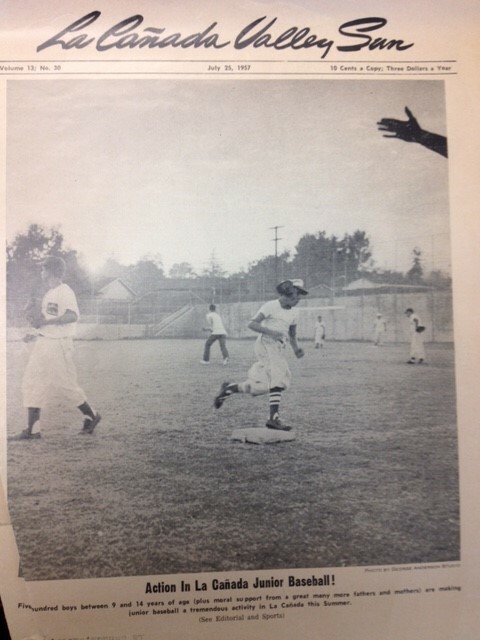 It was March 1955 when 120 La Canada boys marched out onto the baseball field at La Canada Elementary School in front of family, friends, and photographers. They were wearing their brand new uniforms representing the first eight (newly formed) teams for the newly formed La Canada Junior Baseball Association. 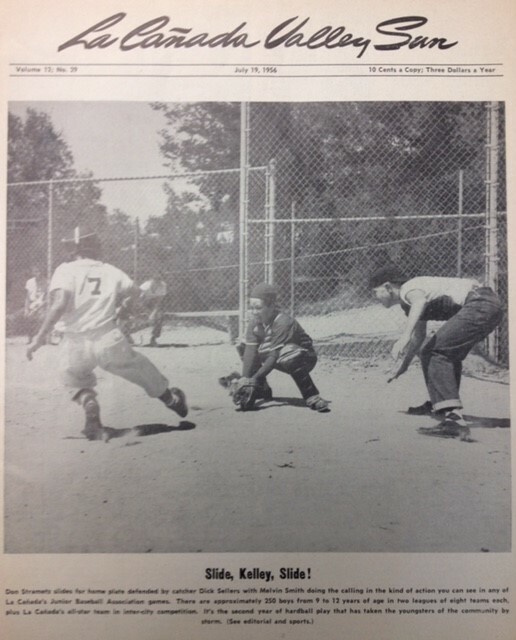 The focus of the founders was on getting more boys playing more baseball, focusing on boys ages 9-12. 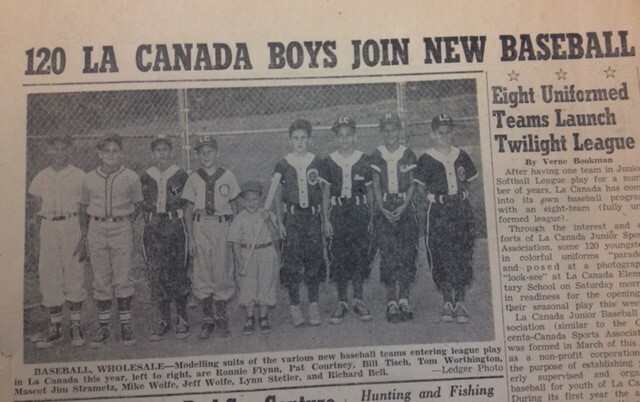 At that time, boys ages 13 and older all played in the Crescenta-Canada Sports Association. League founders had coached in that league for years. In fact, by the time they started LCJBA, Ed Davis’ and Gilbert Smith’s own sons had aged out of the league they helped to found (though Davis’ two grandsons would both play in the league during the 1980s). Thus began a legacy of volunteerism and selflessness that continues today. Moreover, in the first four years of LCJBA Davis’ own children wrote weekly game reports and submitted them to the newspapers (a tradition that continues in 2015 in the Jack Johnson home, as his children compile and edit weekly game reports for submission to the papers). 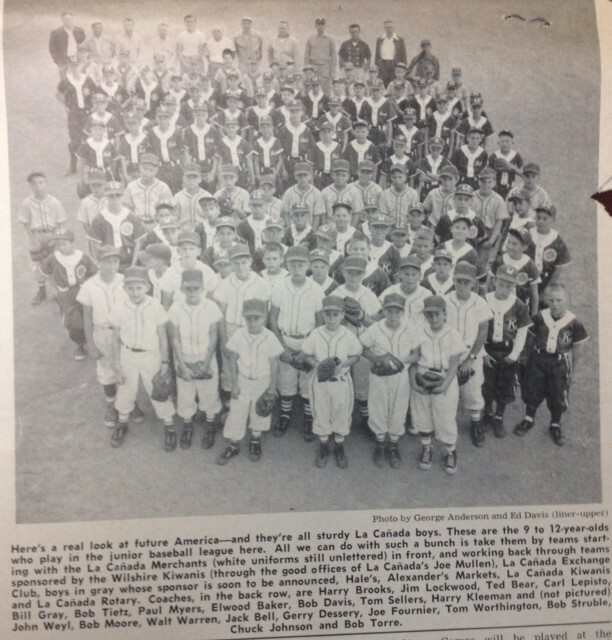 By 1958 there were 600 boys and 185 fathers participating in LCJBA. 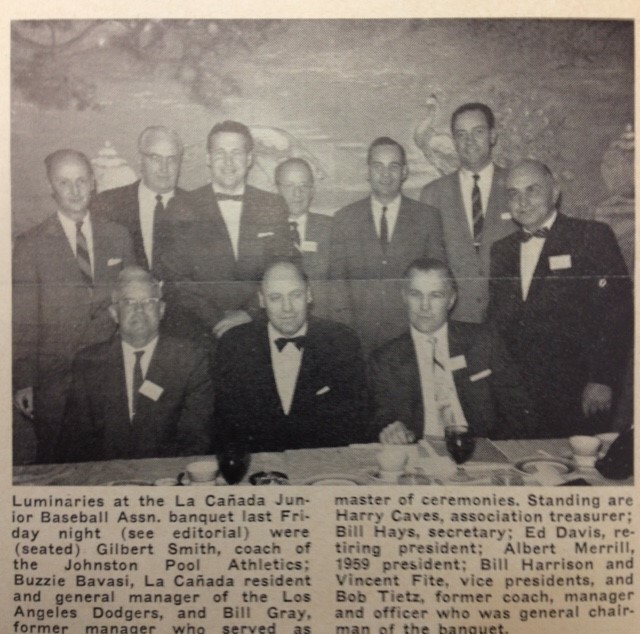 At the 1961 season inaugural dinner, Davis and Smitty were honored for their contributions to La Canada baseball. 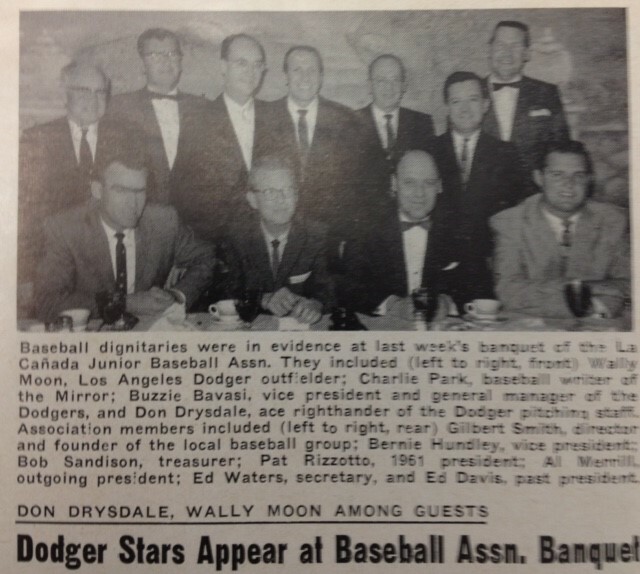 At that event were Dodger dignitaries such as Wally Moon, 1961 Dodger outfielder; Charlie Park, baseball writer of the Mirror; Buzzie Bavasi, VP and GM of the 1961 Dodgers; and Don Drysdale, “ace righthander” for the 1961 Dodgers. At that event, Bavassi “lauded the baseball association for being the only one he has seen not emphasize winning in its well-rounded program while allowing most and sometimes all of the players to get into the game.” LCBSA rules continue to encourage participation over competitiveness. 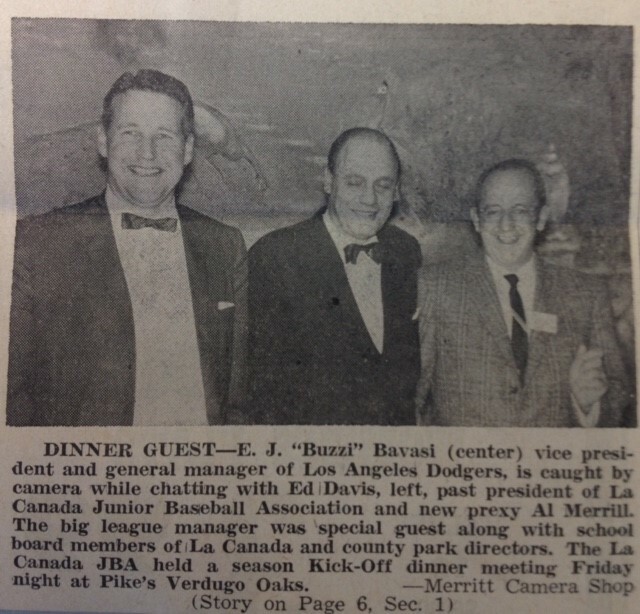 To put the timing of the league inception into context, it was founded BEFORE the high school was built, BEFORE the La Canada Unified School District was organized, and even BEFORE the Dodgers came to Los Angeles! Eventually, girls’ teams were organized (Kathy Bender was among the first to play). Later, a softball component was added and the organization changed its name to La Canada Baseball and Softball Association (LCBSA). With the ebbs and flows of community demographics, LCBSA remains one of the largest youth sports programs in the area with over 700 children playing ball! League officers remain committed to the founders’ vision of “more kids playing more ball.” League rules are still emphasizing participation and skills development over achieving every marginal advantage for the win. Safety remains at the core of league decisions. Managers are still evaluated on their behavior and attitude with youth. League leadership is still comprised of parents and non-parents of players, all of whom are dedicated to the development of fine youth in our community. And LCBSA continues to help weave the fabric of “community” as friends and families come together to enjoy the country’s favorite past time. Our gratitude to the founders of this league is expressed in our remembrance of their legacy and in our efforts to keep it alive. Thank you to decades of families and small businesses that sponsor our teams. Thank you to decades of city and school district officials who have worked with us in such a collaborative and supportive way. Thank you to the hundreds of volunteers that muster time and energy and resources EVERY YEAR to enable children to play ball in La Canada! A special thank you to Dianne Whiting for providing newspaper clippings, historical context, and entertaining stories about her dad, Ed Davis. Dianne was asked to throw out the first pitch for the 2015 season, commemorating 60 years of La Canada Baseball, and to receive a special award on behalf of the Davis family. Two rainouts delayed the first pitch until the end of the 2015 season. It was as if Ed Davis himself was trying to avoid the recognition he deserves . . . even 60 years later!